What do you redeem your Pampers Rewards points on? A lovely reader alerted tonight that the Shoppers Drug Mart $10 gift card is back in the Rewards Catalogue! 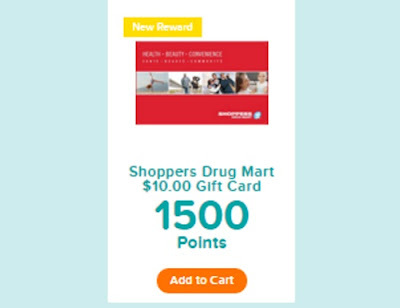 You can redeem 1500 Pampers Rewards points to get this gift card. I redeemed mine right away as these perks do not last long. I rarely see gift cards in the Rewards section so when I do I make sure I get it right away! To see this reward, sort the rewards by "newest" and it should be the first one on the list, while it's available! Just a reminder, you do not need to have children to sign up for this program. We post Free Pampers Rewards codes on this blog all the time when they are available and all the codes that I've ever entered were from those and I've redeem 3 times now. Of course, points add up faster if you are entering them actively from Pampers products as well. Click here to sign up for Pampers Rewards. Click here to view the Pampers Rewards Catalogue.